President Tsai Ing-wen has ambitious plans for energy production in Taiwan’s energy and by 2025 has pledged to make the island nuclear free. At present, nuclear power accounts for around 14 per cent of Taiwan’s total electricity generation while renewable sources account for less than 5 per cent. If Taiwan is to achieve its objective of having solar power account for 73 per cent of its total renewable energy capacity by 2025 programs will need to be developed and implemented quickly. Taiwan’s current solar capacity is 1,061 megawatts and the plan is to double this by mid-2018. However, if it is to meet its ambitious 2025 target Taiwan will need to increase its current capacity by nearly 20 times within nine years. Doing so could mean solar panels take up around 25,000 hectares of land on the island which would be an area nearly the same size as Taipei, Taiwan’s capital city. In summer time temperatures outside can reach 33 degrees Celcius meaning that the 6,000 installed solar panels on the 10,000 metres of the prison’s roof space can easily generate renewable energy. Prison Vice Warden Lin Chen-rong says “We are primarily a resource for absorbing solar energy.” Due to existing regulations in place, Pingtung, will not be able to keep any of the revenue it generates from its solar panels nor can it directly use the power itself. Before lights out for the prisoners at 9pm each night the prison runs on electricity from the state-owned national Taipower grid. Lixma Tech Co is the organisation responsible for developing and implementing the Pingtung prison solar project. It has covered all construction costs but will benefit from receiving around T$9 million (around USD 300,000) per year from Taipower for the solar power it feeds into the national grid. Lixma has entered into a twenty year contract with the Taiwanese government and is planning to build similar developments at other prisons. Its CEO, Thomas Tsu, said Lixma does not even expect to break even from the project until it is in its ninth year. 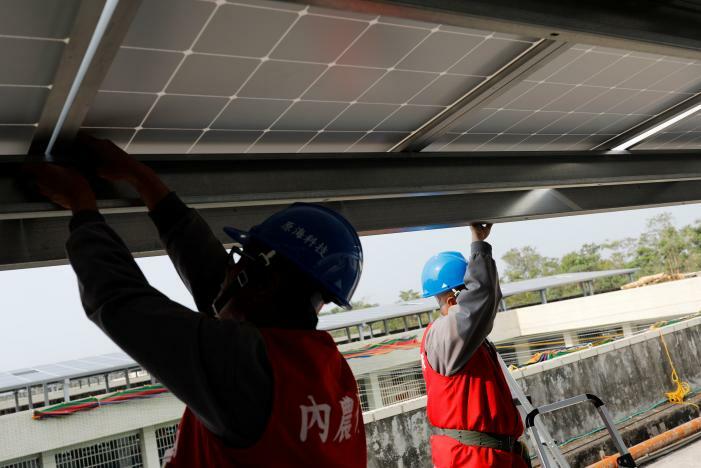 Prisoners were used to install the solar panels at Pingtung. This helps reduce installation costs as labour costs are lowed and also affords the prisoners selected to partake with the opportunity to develop technical skills. Such skills could be used when they leave prison and help them to find meaningful employment. Taiwan is not the only country experimenting with solar powered prisons. In the United States prisons are becoming solar powered to save taxpayer money and enable environmental benefits by reducing carbon emissions. Solar power prisons can already be found in the states of California, Illinois and Texas. In California, 83,000 solar panels will be required in order to convert four prisons to solar power and generate 25 megawatts of solar power per year which is equivalent to taking 90,000 carbon dioxide emitting cars off the road. In South Africa, Robben Island, the prison famous for housing Nelson Mandela is also in the process of transitioning to 100% solar energy. Furthermore, it will be used as a pilot project for the conversion to solar power of South Africa’s national parks, botanical gardens and other heritage sites and forms part of an initial $15 million program to boost tourism.